I’ll Buy That! was a game show hosted by Mike Wallace back in the days when Mike Wallace sometimes hosted game shows. The show debuted June 13, 1953 and lasted a few months into 1954. Home viewers would send in items they wished to sell and a celebrity panel headed by Vanessa Brown and Hans Conreid would attempt to guess what each item was. Every time they made a wrong guess, the “selling price” would go up. How was it? A fine question. There don’t seem to be many (any?) episodes around. But its cancellation and the failure of a few other attempts got Wallace out of the game show hosting and into news work. So that’s something. 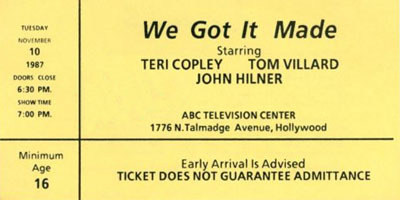 We Got It Made was a situation comedy that ran on NBC from September 8, 1983 until the following March. At first, sufficient audiences tuned in to the series which was about a gorgeous woman (Teri Copley) working as a housekeeper for two single men (Tom Villard and Matt McCoy) and getting involved in their lives and love lives. After a short while, viewers began to drift away and so did the show. Usually, that’s the end of a series like that and it’s never heard from again. But in 1987, We Got It Made came back to TV in a syndicated version. Copley and Villard returned, McCoy was replaced by John Hilner and most of the supporting cast also changed. This version didn’t click either and while it lasted out the year, that was it. Masquerade Party was one of those shows that went from network to network and from host to host. It started on NBC in 1952, went to CBS in ’53 and ’54, went to ABC, then back to NBC then back to CBS. Along the way, its hosts included Bud Collyer, Douglas Edwards, Peter Donald, Eddie Bracken, Robert Q. Lewis and finally Bert Parks. The four member panel was in a constant state of flux. But the premise didn’t change. The host would introduce a “Masquerader” — some celebrity who’d come out in heavy-enough make-up that you couldn’t tell who it was. The outfit and a little routine the Masquerader would perform would be a hint. For instance, when George “Superman” Reeves was a Masquerader, they had him dressed up as a giant pack of Kent Cigarettes, which just happened to be a sponsor. The panelists would ask questions and try to guess who the celeb was…and at the end, there’d be an unmasking which was often messy. That was it. Usually, there’d be three games a show which led to one of the show’s main weaknesses. Sometimes, to find three Masqueraders to fill a half-hour, the definition of a celebrity had to be pretty low and it sometimes descended into folks the panel had never heard of. That of course made it tough for them to figure out the answer. Very few episodes of this show are known to exist. Before his passing, ventriloquist Paul Winchell scoured the country looking for a kinescope of a time he was on with his idol, Edgar Bergen. The two of them were joint Masqueraders playing Dr. Jekyll and Mr. Hyde — one playing one, the other playing the other. Some of the costumes and clues were quite clever, especially during a period when Allan Sherman, who’d been fired as producer of I’ve Got A Secret, was brought in to run things. In his autobiography, Sherman says that when the job was offered to him, his initial reaction was to turn it down because he thought the show was lousy. But he needed the job so he took it but didn’t put his name on the program…until it rose up to pass I’ve Got A Secret in the ratings. In 1974, the show had a brief revival hosted by Richard Dawson but it was cancelled after one season. James Darren was a popular singer and actor, and all we know about this ticket is what’s on it. There’s no record of The James Darren Show ever making it onto the CBS (or any network schedule) so this is presumably an unsold pilot. Since it was taped at the Ed Sullivan Theater, it was probably a variety show or a talk show…and beyond that, it’s a mystery. Your Surprise Package was a short-lived game show on CBS that’s most notable as the last such program produced by Allan Sherman. Sherman had co-created and produced I’ve Got A Secret, then gone on to other shows with varying degrees of success. When he signed on to this one, he didn’t imagine it would lead to so many changes in his life, starting with the necessity that he relocate from New York to Los Angeles. There was a shortage of available studios in Manhattan then, plus CBS liked the idea of George Fenneman — best-known as Groucho’s sidekick from You Bet Your Life — as host. Fenneman wouldn’t commute from L.A. so the Shermans had to move. It was not a great show. Contestants had to answer questions to win mystery boxes containing prizes of varying worth. Bern Bennett was the announcer. Carol Merrill, who would later gain fame as the prize model on the original Let’s Make a Deal was the prize model. The show went on the air in March of 1961 and didn’t do well in the ratings. As you can see in the two tickets above, they lowered the minimum age to attend — often a sign that a show is having trouble filling its bleachers. By the date of the second of the two tickets above, Sherman was making the rounds, trying to line up the job he’d do after Your Surprise Package was axed. He needed money. Earlier in November, much of the wealthy Southern California community of Bel Air burned…and while Sherman didn’t lose his new home there, there was considerable damage not from the fire (for that he had insurance) but from a subsequent flood when heavy rains hit L.A. and the hillsides around Bel Air were barren of vegetation and thus sending the water straight down into the community. Sherman was out of work a short time before he was hired as the producer of a new syndicated talk show that Steve Allen was doing for the Westinghouse Broadcasting Company. Within weeks and before the show even went on the air, Sherman was fired due to clashes with management. In August 6, 1962 — not all that long after the above ticket — he recorded a record called My Son, the Folk Singer and within months, it was the fastest-selling comedy album ever. It made him very famous, very successful and very unlikely to ever produce another game show. This was not a good idea. Chevy Chase had a sky-high TVQ score, TVQ being a survey that networks subscribe to. It tracks many things but mainly how well-known someone is and how well they’re liked. At the time, Mr. Chase’s TVQ score on both counts was a lot higher than most of the names you’d have come up with if you were a Fox executive and they asked you who should host a late night show for them. Mr. Chase was signed for a huge sum of money. The show went on the air September 7, 1993. Four weeks later, its cancellation was announced and then Chevy did one more week, most of which was spent joking about how poorly things had gone. Fox had guaranteed advertisers a tune-in of six million viewers but even the show’s first week hadn’t reached that number, coming in around three million. Before long, they were down to two. Within Fox, two reasons were usually given for the failure. One was that no one ever had an idea what would make Chevy’s version of The Tonight Show different from, say, the one Jay Leno was doing over at NBC under that name. The other reason was that Chevy was really more interested in his movie career and wasn’t especially committed to the venture. Whatever the reason, the show’s quick demise was predicted by critics from Day One. Fox lost a lot of money. Along with what they paid Chase and the “make goods” (free commercials) they had to give to advertisers to make up for the ratings shortfall, there was the money spent to secure the Aquarius Theater on Sunset Boulevard and refurbish it into The Chevy Chase Theatre. Then five weeks later, they had to turn it back into the Aquarius. The building had once been the famous Earl Carroll Theatre, famed for its slogan, “Through these portals pass the most beautiful girls in the world.” It closed on 1948 when Mr. Carroll was killed in a plane crash and then reopened in 1953 as the Moulin Rouge. It went through many names and owners after that and in 1968 became the Aquarius when it was the home of the Los Angeles production of the tribal rock musical, Hair. Today, it’s owned by Nickelodeon that has some of its offices and production facilities on the premises. We’re not certain what this is. In 1981, the fine comedy and Broadway star Jack Gilford starred in an hour-long made-for-cable special called The Jack Gilford Show but that’s not what this ticket was for. It looks like the folks behind The Mary Tyler Moore Show put together a sitcom pilot for Mr. Gilford, filmed it and then it didn’t sell. Anyone with any more info, please share it. Freddy Martin was a popular “Big Band” leader who hosted a music show that ran on NBC starting on July 12, 1951 where it was a summer replacement for Martin Kane, Private Eye. Intended to go off when that show returned in the Fall, it stuck around on NBC until November. It was a half-hour of songs that is best remembered because of Freddy Martin’s lead male vocalist, Merv Griffin. It was Merv’s first TV show but it wouldn’t be his last.